There are many areas in America, like North Carolina, that experience inclement weather situations throughout the year. From snow to hurricanes and thunderstorms, the last thing you want is for your roof to leak. Whether you want to install shingles, clean your gutters, or even re-caulk your roof, many homeowners wonder if they can DIY their roofing projects. If your roof springs a leak, you might feel tempted to handle the repairs yourself with a popular DIY fix. The internet is home to thousands of DIY roof repair, roof replacement, and roof leak repair tutorials. Although this approach can work out sometimes, the risk that you won’t fix the problem correctly, or even make it worse, are high. While there are some minor roof leaks you can fix on your own with a little help, most roof leaks are best left to a professional roofing company who is certified in residential roof maintenance. If your roof starts to leak, you can suspect worn, damaged, or missing roofing materials as the likely culprits. You will need to perform a thorough inspection to check the integrity of your shingles, flashing, vent pipes, and other roofing materials to find the true source of the leak. Shingles - Broken or missing shingles can allow water to flow down into your living space. You can check out our list of five ways to know if your shingle roof needs attention here. Flashing - Your roof flashing protects areas where opposing roof surfaces meet. This sealant that is used to join the valleys of your roof is prone to leaks if left in poor condition. Check that your roof flashing is free of cracks, which can allow water to flow in to start a leak. Caulk - You should check and make sure that areas on your roof with caulk have a solid bead of material to keep water out. If you notice any breaks in the caulk bead, then you may have found the cause of your leak. Gutters - During your roof inspection, turn your attention to your gutters to see if they are properly draining water away from your roofing materials. If you have any leaves or other debris blocking flow through your gutters, the water could back up onto the roof, which could be fueling your leaky roof. Roofing repairs involve using a ladder and working in an elevated environment. If you are not experienced in this area, we recommend that you leave any roofing work to an experienced roofing expert. While not recommended, there are times where you can easily handle minor roof leaks on your own without a roofing professional with a few simple tools and a little know-how. Roof Leaks Caused by Caulk - If you inspected your roof and noticed the roof caulk was cracked or in poor condition, you may be in luck. To start replacing the damaged caulk beading, you should first make sure that your gutters, shingles, and other roofing materials are in top condition and are not in any way contributing to the roof leak. After you have singled out the caulk as the problem, you can fully remove the caulk and replace it using industry-proven practices to achieve the best results. If you are not confident in your ability to fully remove, replace, and seal the caulked areas, then it is perfectly fine to leave this job to a roofing professional. Gutter Cleaning - Your gutters are one of your first lines of defense against extensive water damage to your home, like roof leaks, and maintaining them will help stop leaks before they happen. Gutters and downspouts should be cleaned on a regular basis. Pull all leaf litter and other debris out of your gutters and check their function at least once a month to keep your roof draining water away from its surface. Again, while this minor roof issue can be DIY, it is best to hire a roofing professional to make sure your cleaning is done correctly, and so the professional can alert you of any other roofing issues. 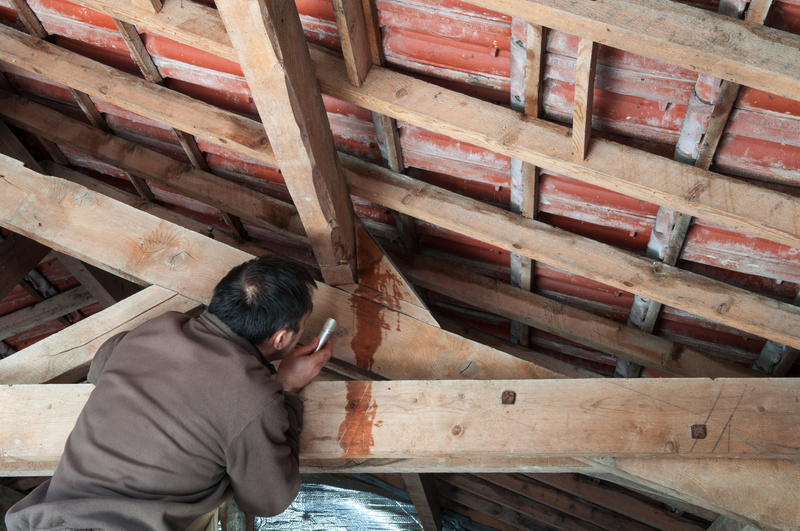 When a roof leak develops, you need to act fast to fix the leak, or else you risk extensive damage to your home. Even a minor leak can cause extensive damage to your home’s building materials in a short period of time. What you might think qualifies as a minor roof repair might actually need a full roof replacement. For moderate to severe leaks, you may only have a matter of hours to take action before the damage becomes catastrophic. When you call a professional roofing company specializing in residential roofing services, you are ensuring that your roof leak will be fixed right the first time around. An experienced roofing contractor has working knowledge and training on working with all elements of roof leak repair, from general roofing knowledge to ladders and heights. Inspection - Through the completion of an inspection, your roofing expert will asses the damage, and will go over the roof leak repair cost and the underlying causes of your leaking roof. Roof Leak Repairs Begin - Once you authorize the work order, your professional roofing expert can start on the required repairs to restore the function and beauty of your roof without the risks of DIY fixes. Most roofing companies will cover your home with a tarp to keep rain and snow from causing further damage until the necessary roof repairs are complete. Maintenance Recommendations - True professional roofing companies don’t want unhappy customers and will always keep your best interests in mind. Your professional roofing experts should give you as much information as possible about your roof, and help you come up with an effective maintenance plan to keep roof leaks from affecting your home in the future. When it comes to roofing repairs, you might find yourself wanting to fix the issue yourself. While many aspects of your home, like interior painting and gardening, can be DIY, it is always best to trust roofing maintenance, roofing repairs, and roof replacements to the residential roofing professionals. If you are in the Durham or Raleigh, North Carolina area and find yourself with a leaking roof, you can trust that Pickard Roofing will be there for you and your home.